The new line from UFT leadership is that anyone who opposes junk science evaluation, which they helped write into the law, is a Tea Partier. To them, this is code for people who just say no to everything--they are simple-minded, contrarian galoots who speak only to hear the sound of their own voices, or to create problems for no reason whatsoever. However, by their standard,we are in very good company here. Diane Ravitch is a Tea Partier. She's written extensively on why VAM is junk science. Just days ago, she praised Hamburg, NY teachers for voting down a junk science plan. A huge difference between Hamburg, NY and New York NY is that Hamburg teachers, rank and file, actually got to vote on this system. This is a big plus for those of us who believe in democracy, where the people have the ultimate voice. What is the word for people who don't believe in democracy? Nonetheless, Ravitch has been a consistent and outspoken opponent of VAM, growth model, or whatever it is they're calling this weeks rat juice. Aaron Pallas is a Tea Partier. Pallas has written brilliantly, in various venues, on the lack of validity of so-called value added. He had a great piece about how 400 DC teachers were fired on standards that may have been invalid. Many of us here see people fired for no reason and say to ourselves, "This is absolutely unacceptable." It's very tough to make the argument we're simply being negative for no reason. 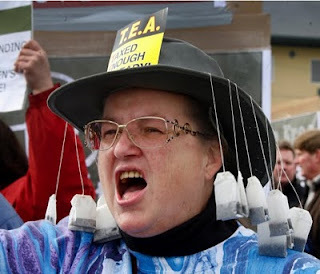 Principal Carol Burris is a Tea Partier. She's written repeatedly for the Washington Post on the myths and misconceptions of this system. She's likened it to building a plane while in the air, and explained very clearly why that may not be the best of ideas.I've seen her speak against it, and find her eloquent and persuasive. Furthermore, she has very definite ideas about where this is leading. But, according to UFT leadership, she's an empty-headed Teabagger making trouble for no reason whatsoever. One third of New York State Principals are Tea Partiers. They signed a petition opposing this evaluation system. I've spoken to principals who say they'll have no time to do anything but observe, and that this will certainly cut into the time they would have spent helping struggling new teachers. In fact, despite what Leadership Academy grads (many of whom have little or no classroom experience) may say, the fact is that helping teachers is really one of their primary roles. Finally, AFT President Randi Weingarten is a Tea Partier. She specifically referred to value-added modeling as junk science, earning kudos from not only Diane Ravitch, but also from yours truly. Yet, by the definition set forth by my UFT leadership, not only all those mentioned, but I too am a Tea Partier. Still, it's pretty distinguished company in which I find myself. Let UFT leadership engage in juvenile name-calling, if that's how they feel they can best defend this abomination they wish to foist upon us.